Click clack. Click clack. I woke up about 0400 to a sound I could not immediately identify. “What is that?” “Ah, it’s the sound of a mooring ball banging against the hull of the Far Reach.” There was little wind so the ball was trying to occupy the same space as our hull. I got up and used the boat hook to push it off. The pendant with the pick-up buoy was on one side of the boat and the mooring ball on the other. Back to bed. When I finally got up Tricia had the coffee going and was standing at the foot of the companionway looking out over the bridge deck and across the stern of the Far Reach taking in the lovely tropical panorama. After years of hard work I can finally say it was worth it. The Far Reach making her way up the Drake Channel. 4 Jan 2016–The Far Reach, Anchored, Dead Man’s Bay, Peter Island, BVI–At 1045, 3 January, we departed Cane Garden Bay under single reefed main and stays’l. Prior to departure we topped off our water tanks by ferrying 18 gallons of water from the small marina back to the boat. We also found a small reef to snorkel the day before only 100 yards from where we anchored. I think the kids will enjoy swimming there. The Far Reach anchored in beautiful Cane Garden Bay. 2 Jan 2016, The Far Reach, Anchored Cane Garden Bay, Tortola, BVI–We departed Jost van Duke this morning and beat up-wind (of course!) 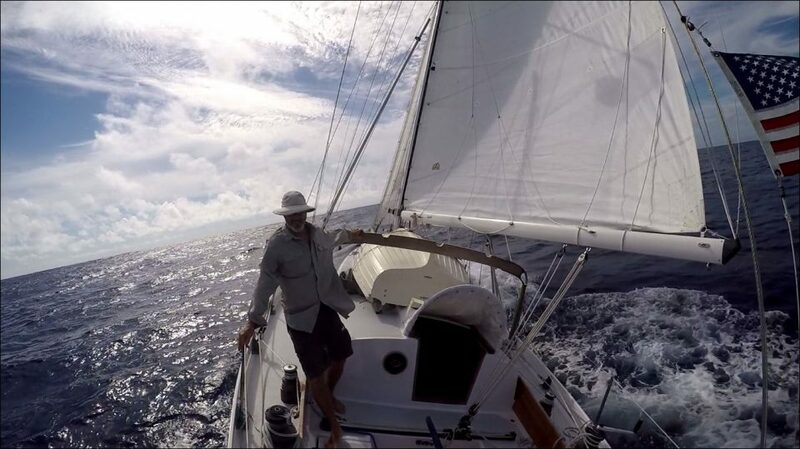 under a reefed main, working jib and stays’l to Cane Garden Bay on the west side of Tortola. The indications are the winds will slacken a bit to about 15-20 kts and it was a pretty comfortable, though short, sail.